Why a Facebook Group for The ICs? One of the tenets of The Independent Characters Podcast is making you feel like a part of our extended gaming group. Over the years we have had a lot of guests on the show, speaking about various topics. This group provides you a way to interact with the various hosts of the show in a way that the main Independent Characters Facebook Page does not. This group is moderated by multiple people to ensure the high standards of our show and our community. Some may consider the approach we take to be a bit restrictive. 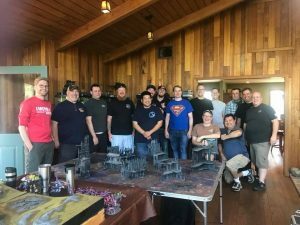 This group is here to support our listeners and people of a similar mindset as ourselves about Games Workshop and more specifically Warhammer 40,000. What kind of posts should go here? This is a place for people to share their ideas and plans, what they are working on and what special things THEIR group is doing. If you have questions or comments about the latest episodes of The Independent Characters Podcast, those can get posted and responded to here. Additionally, if you want to reach out to specific guest hosts of the show, they too will typically be on this group and can be contacted here. What kind of posts should NOT go here? The Independent Characters is about celebrating the Warhammer 40,000 game and hobby. Is the post you are about to make encouraging good discussion in a constructive, positive, and helpful manner? Or is it another complaint about Games Workshop prices? Even criticism of Games Workshop rules or products are fine, if they are well thought out and CONSTRUCTIVE. So while it may seem that there are a lot of bullet points below – most won’t apply to you and it really boils down to keeping things in the spirit of the Podcast. If you don’t listen to the show – you really should! Think hard about the post you are about to make before you click submit. We leave it up to you. However, if a post is going to be removed, you can expect a PM from a group moderator first. The group is considered PG-13 so please keep foul language to a minimum. Additionally, personal attacks against others are grounds for an immediate ban. Please report such incidents to a moderator. Advertisements for your business, your painting commission work, etc. should be approved by a moderator prior to posting. If you have any doubts, reach out to a moderator. This includes posts made to link to your Blog, YouTube Channel, etc for generating traffic will not be allowed. Note that If you are posting a link relevant to an ongoing conversation, that is acceptable. We also don’t want to see the same topics here posted in every other 40k group out there. So if you are posting the same thing in other groups, please do not post it here. Many of us are members of other groups and will see the duplication. Please do not start threads with or about memes. They are everywhere these days. We don’t need to see them here. You are welcome to respond with silly memes and such – but this isn’t a meme sharing group. If you are thinking about making a post and you aren’t sure if it’s appropriate or allowed. Please don’t make the post and add “remove if this isn’t allowed”. Read the community guidelines in the description on THIS page. If that doesn’t answer your questions and you STILL aren’t sure. ask an admin first. No posting of lists containing Points or Power Levels please. This has been a long standing way to upset Games Workshop and we would prefer you didn’t include them here. There are a lot of Warhammer 40,000 groups out there and much like Podcasts, a lot of them are fulfilling the exact same purpose of the next one. It is important to us here that this not be just another Warhammer 40,000 Facebook Group, but a place where our listeners can come and enjoy follow up discussion about topics raised on the show and share ideas which may ultimately make it onto future episodes. If this sounds too restrictive to you – this might not be the place for you. That’s okay! There are plenty of Podcasts and Facebook groups out there. Certainly there is one or more that will cater to your needs. However, our community is one that is based upon respect, enjoyment, and being a part of our gaming group. It’s been a very successful recipe for us so far. Thanks for reading, and thanks for joining our community!